A Pronoun is a word which is used in place of a Noun. It refers to a noun. It is used to avoid the repetition of Noun word in a sentence. 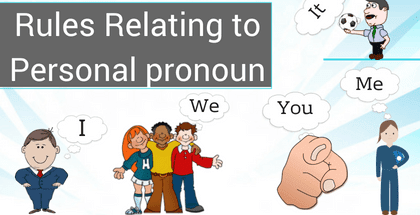 1 Personal Pronoun I, We, You, Me, It etc. A pronoun should clearly refer the noun it stands for. When it is not obvious to which antecedent a pronoun refers, the sentence should be corrected. This can be done either by repeating the noun, or by rewriting the sentence to make the meaning clear. My friend, wearing a red sari, was there with her aunt. The possessive adjectives must agree with their antecedents. The boy obeys his father. The girl likes her mother. When a gerund is preceded by a personal pronoun, the pronoun must be in the form of a possessive adjective. The girl said that her writing had improved. The boy entertained the guests with his singing. The possessive form of a personal pronoun which is called as possessive pronoun, can be used in the place of a noun. He did not bring his briefcase, but I brought mine. Because I forgot my pen, she lend me hers. When a pronoun follows “Let” we use the objective form of Pronoun. Subjective form should not be used after “Let”. You, he and I are partners. We and you cannot live together. We, you and they can purchase that shop. I and you are responsible for the loss. You and he spoiled the party. You and I have done our job. You and he have completed your job. The crew revolted and murdered its captain. After three days, the jury gave its verdict. When two or more nouns are joined by ‘and’ the pronoun used would be Plural. Ram and Mohan went to their school. Note: If both the nouns joined by ‘and’ denotes the same person, the pronoun used would be Singular. When two Singular nouns are joined by and preceded by each or every, the Pronoun used would be Singular. Singular Pronoun and Singular verb is used with; Each, Either, and Neither. Each of the students is ready to do his duty. Neither of them gets his turn. Singular pronoun is used when two or more singular nouns are joined by ‘or’, ’Either….or’, or ‘neither…..nor’. Either Ram or Manu lost his purse. Note: If one noun is Plural, then the Pronoun should be Plural and Plural noun should be placed near the verb.